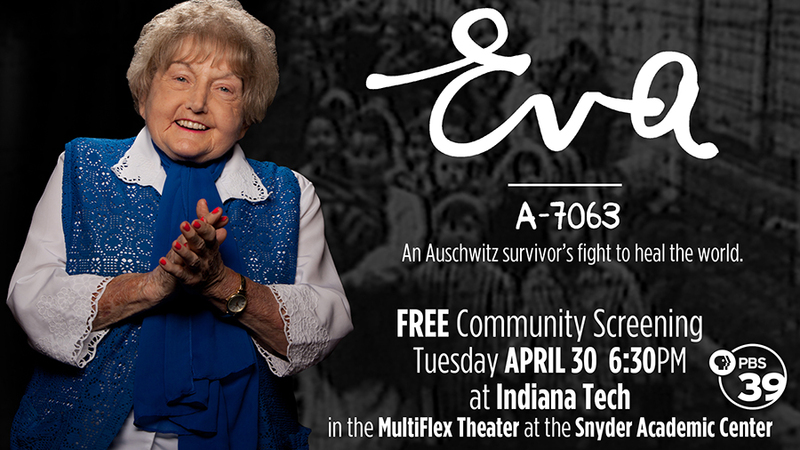 PBS39 is proud to invite you to a free community screening of the documentary film EVA: A-7063 on Tuesday, April 30 beginning at 6:30pm in the MultiFlex Theater on the Campus of Indiana Tech near downtown Fort Wayne. EVA: A-7063 recounts the incredible true story of an Auschwitz survivor’s journey to forgiveness and healing. At the age of 10, Eva Mozes Kor fought to stay alive inside the concentration camp where she and her twin sister Miriam endured cruel experiments devised by Nazi doctor Josef Mengele. After decades of torment and pain following her liberation, she decided to use her experiences as a teaching tool for other generations. Despite health issues, the 4-foot-9, 85-year-old circles the globe delivering her messages of healing and self-empowerment. She addresses current global atrocities, as well as two of the biggest problems facing today’s youth — bullying and discrimination. Narrated by actor Ed Asner, this film weaves Eva’s story together with footage in Poland, Germany, Israel, Romania, England and the United States, along with interviews from CNN’s Wolf Blitzer, whose grandparents died in the Holocaust; actor Elliott Gould; and former pro basketball star Ray Allen (a member of the U.S. Holocaust Memorial Council). Watch a trailer for this film, below.